Home decor styles may vary, but one thing is for certain: Hardwood is a top flooring choice for homeowners. It’s timeless and durable, making it ideal for many lifestyles, and it often adds to a property’s value. When choosing the perfect wood floor for your home, think like a designer. Consider style, maintenance, and budget before you commit to any one type of hardwood. With so many colors and materials to choose from, you may find it challenging to make a selection. To help you narrow down your options, we at Kerrie Kelly Design Lab spoke to other expert interior designers about how they choose the optimal hardwood floor for their clients’ spaces. When choosing a hardwood floor, consider style, personal preference, lifestyle, and the home’s construction. At Kerrie Kelly, we often tour a client’s home before any renovation or design work begins so we can see firsthand how the family interacts with the materials and elements in their home. Our team frequently notices things even the client doesn’t, like the family’s tendency to keep shoes on in the home or how often the dog runs down the hall after the kids. Byron Risdon, a designer out of Washington, D.C., offers this advice: Assess the space and how your daily activities affect your floor. “One of the first things I consider is the type of space I’m working in. Is it new construction? Should we respect the integrity of the home?” he says. Elle Cole, owner of Elle Cole Interiors in Dallas, agrees it’s important to keep function in mind when helping her clients choose flooring. After she gathers her clients’ expressed wishes, she asks key questions about their routine. “It’s not about selecting a floor solely based on aesthetics,” she says. Functionality matters as well. For homes with a high level of wear and tear, such as those with kids and pets, homeowners should choose a durable variety of wood. The harder the wood, the better it will resist dings, dents, and scratches. Oak, maple, and cherry have a high level of hardness, while pine, mahogany, and chestnut are softer and more prone to damage. The wood’s finish and the underlayment material will also affect how well the floor withstands its environment. Factory-applied finishes typically come with a warranty and will hold up longer than self-applied finishes. A vinyl or plastic-lined underlayment can help protect the subfloor in areas prone to wetness (great for homes with pets). For households with a lot of activity, a cork or foam underlayment can reduce noise. Humidity and moisture can affect your wood, causing swelling or warping. If you live in a humid climate, be sure to have a proper air conditioning system in place to keep your hardwoods in good condition. When it comes to color, Cole advises clients to take inspiration from their environment and surroundings. An airy and bright setting like a bungalow in a sunny desert town calls for a different look than the sleek and moody atmosphere of a city apartment. “If you live in Palm Desert, you might lean toward lighter hardwoods. Alternatively, darker hardwood flooring would be appropriate for living in the city in a high-rise,” she says. When to choose dark colors: As Cole points out, the wood finish that’s right for you is subjective. It depends on personal preference as well as overall style. However, if you just can’t decide, you can’t go wrong with the versatile look of a dark wood floor. “If you are going for a timeless look, a darker wood tone will always be applicable,” says designer Kia Weatherspoon, president of D.C.-based Determined by Design. For a traditional aesthetic, consider warm colors and classic elements like wainscoting, Craftsman details, and other old-world features. For an updated aesthetic, complement the floor with whites and grays, and choose furniture with clean lines. Whatever your taste, you can’t go wrong with these statement-making floors. 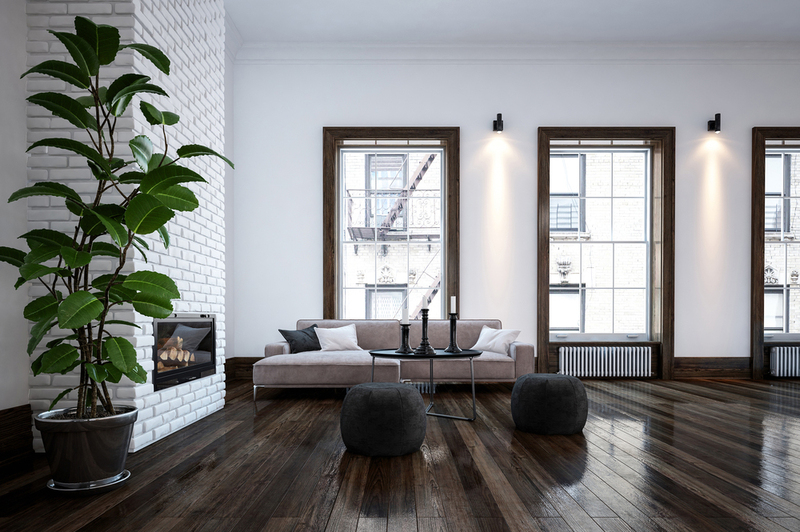 When to choose light colors: Although dark wood floors can go with just about anything, lighter shades of wood can work with a number of decor styles as well, from contemporary spaces to beach and coastal settings. “Gray wood tones are the new ‘light,’” explains Weatherspoon. “They are neutral enough to work with any color palette. Gray tones allow for more flexibility and are ideal for an open living room, kitchen, and dining room layout.” If you’re nervous about lighter wood, don’t be. Cooler shades of hardwood are quickly becoming the new norm, and they can balance many kinds of interior styles, including tailored and traditional, as well as updated and modern. When to choose cherry or golden colors: Cooler shades like gray and extra dark brown have moved to the forefront, with cherry or golden-toned hardwood taking somewhat of a backseat. However, there’s still a place for these traditional wood floors. “A seasonal beach home where there is a great deal of natural light can create enough balance to make a golden-toned floor feel timeless,” says Weatherspoon. When to choose engineered versus natural hardwoods: Today’s engineered hardwoods are nearly indistinguishable from natural hardwood floors. Engineered hardwood has an increased tolerance for moisture, while natural hardwood may begin to warp in damp areas. On the other hand, natural hardwood has a certain richness to it that engineered wood can’t replicate. Longevity is also important to keep in mind: While engineered hardwood is built to last, it is limited in the number of times it can be refinished, whereas natural wood can be refinished many times. This could mean more options when it comes to changing the color down the road. Engineered hardwood is a great budget-friendly flooring choice, while natural hardwood is an attractive selection for any space. When you plan your hardwood-flooring project, consider your lifestyle, budget requirements, maintenance needs, and style. Whether you choose light and bright or cozy and warm, hardwood flooring adds a beautiful touch to nearly any room of the home. 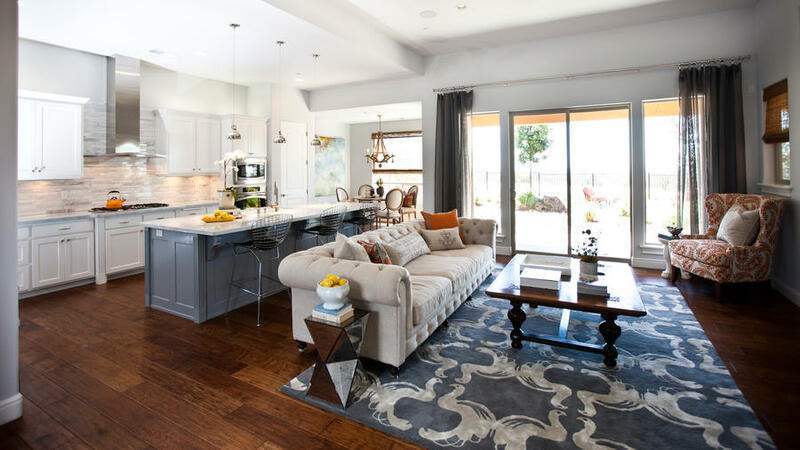 Sacramento-based interior designer Kerrie Kelly of Kerrie Kelly Design Lab shares design advice and inspiration and writes about it for The Home Depot. Kerrie loves to incorporate wood flooring into her designs and provides tips on how to do it. To see a selection of the hardwood flooring options, visit The Home Depot.